I’m a huge fan of Dorie Greenspan. She just published a new cookbook called Around My French Table. Of course, I already have it. The recipes look terrific. I’ve also registered for French Fridays with Dorie. It’s an online cooking group that is going to cook their way through this book. Everyone makes the same recipe, a new one each week. I’ve never participated in anything like this before, but it seems like fun. This is the first week, though last week, I had to bring something savory to a reception. I made these beautiful hors d’oeuvres, Mustard Batons, from Around My Friench Table. 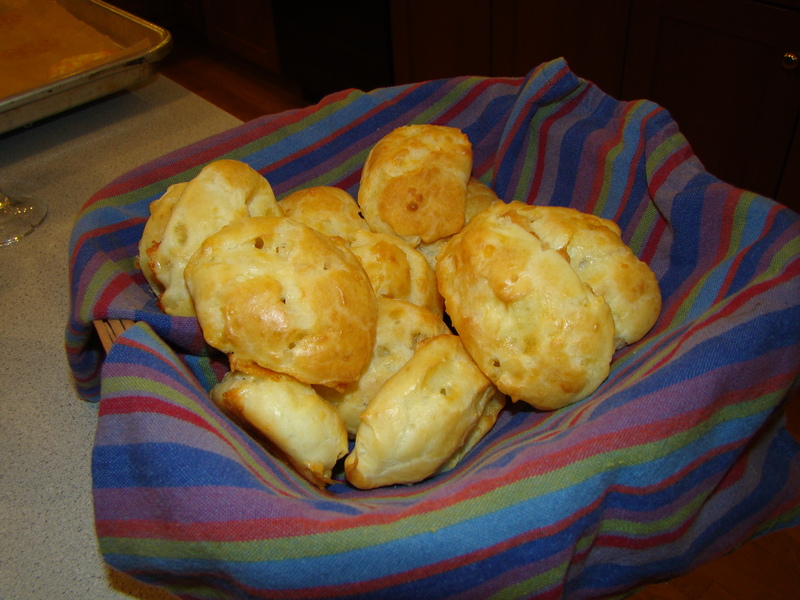 This week’s recipe is Gougeres, which are cheese puffs. Timewise, I thought I’d have to skip the first week, but, as it turned out, I was able to make the recipe to accompany tonight’s dinner, and there’s a little less than an hour left of Friday, so I can post in time. I’ve never made gougeres before, or even eaten them, but everything about them is appealing. They’re doughy, they’re cheesy, and they’re French. What’s not to like? These were fun! And not too difficult. The ingredients are a bit decadent – a stick of butter, A LOT of eggs, and cheese. Yummy! I loved the process. 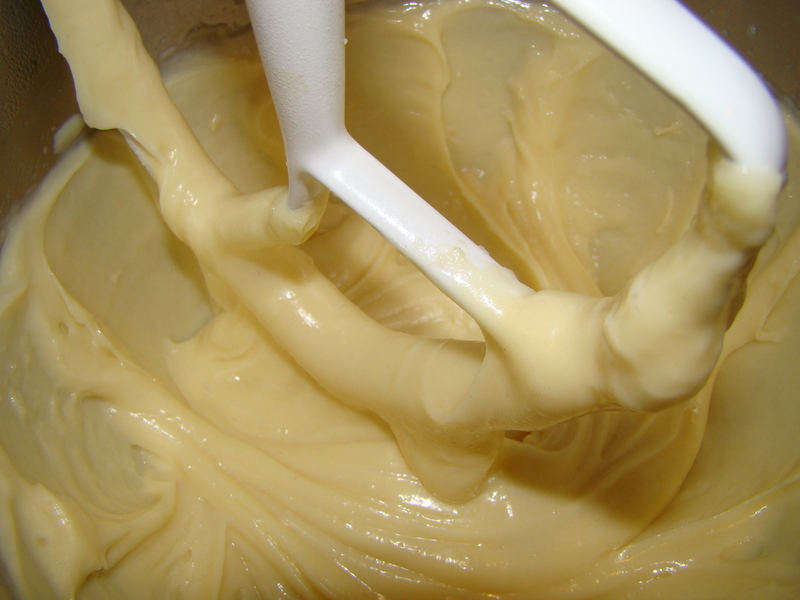 You stir the flour into melted butter and hot milk and it comes together into a beautiful, glossy dough. I’m not sure it was dry enough when I stopped stirring. After beating in the eggs, the dough looked downright silky. My gougeres didn’t puff as much as I thought they would, though they resembled the picture in the cookbook. The insides seemed a little bit wet. As I said, I’ve never had them before, so I don’t have a point of comparison. They were pretty good though, and I would definitely make them again. The gougeres are meant to be appetizers, but we ate them with dinner. My dad and stepmother are visiting for the weekend. Dad gave them his seal of approval, and he’s an expert on anything related to bready food. I wasn’t counting, but he told me he ate at least 8. To go with the gougeres, for dinner we had crab cakes, corn on the cob, and green beans. I’m originally from Maryland, so I have to have an old family recipe for crab cakes. This is my version, based on my mother’s recipe. I’m sure my sisters have their own, slightly different variations on the same original. In a large bowl, combine the egg, mayonnaise, mustard, Old Bay Spice, and parsley. Add the crabmeat and crackers, and stir to combine well. Season with salt and pepper to taste. Form the mixture into 8 patties. Heat ¼ inch of vegetable oil in a griddle or large skillet over medium-high heat. 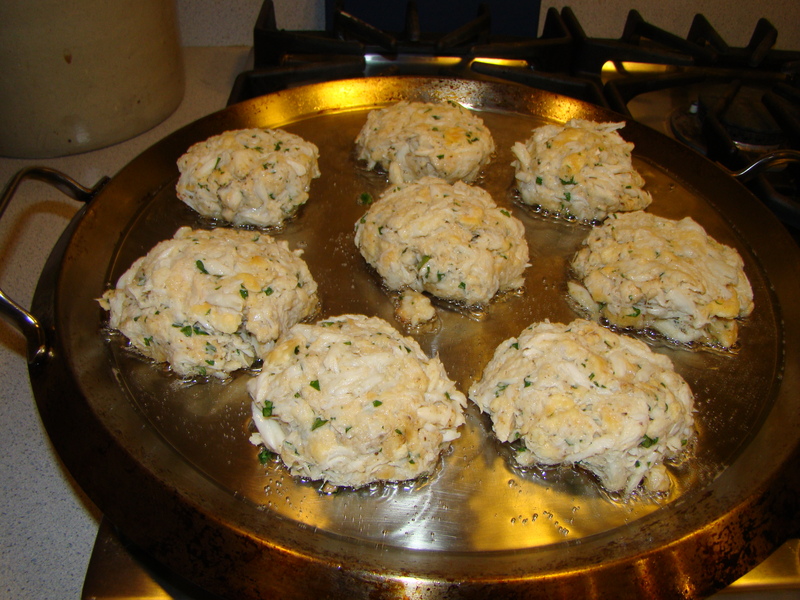 Saute the crab cakes for 3-5 minutes per side, until golden brown. Posted on 1 October 2010, in French Fridays with Dorie and tagged crab. Bookmark the permalink. 4 Comments. I’m a fellow FFwD blogger. I, too, LOVE Maryland style crabcakes, but I’ve actually never had them with club crakers. I use bread crumbs … usually Italian seasoned. It sounds very tastey. I also thought a seafood type dinner would be great with these cheese puffs. Great work! they look so amazingly yummy!! wish i lived closer…. i certainly would never think you were a cooking slacker but then again i never cook i admire!!! Your gougeres look great. 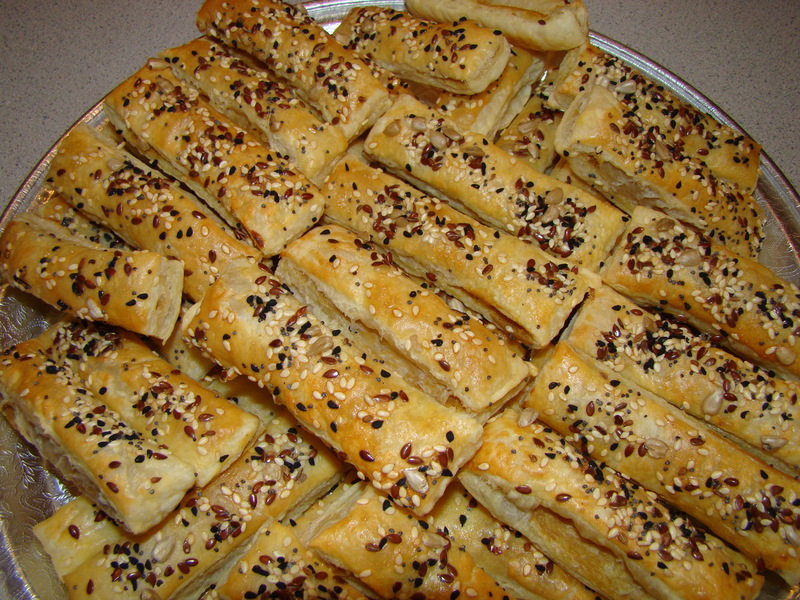 And the mustard batons are on my list of recipes to make soon–they look yummy.